Think of it as the aural equivalent of a Lego set. One can use the simple bricks in different styles and colors to make something that stands out as special. Joss Stone has never hid her ambitions to conquer the globe. In her public statements and on her recordings, Stone’s persona has always been boastful and proud. She’s currently on a world tour in which she plans to visit 204 countries in three years. 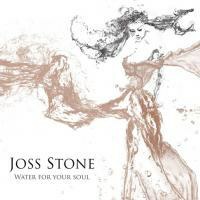 Stone is also taking on world music on her reggae-based new album, Water for Your Soul. The results are somewhat mixed. Sometimes the riddims set her free to pursue her muse in creative ways. Other times, the beats seem to slow her down when she should be frolicking harder. It varies from cut to cut, but on the whole Stone’s music provides a pleasant soundtrack for everyday living. Ironically, the most laid-back tracks are the most invigorating, while the ones with the more strident melodies seem to drag. For example, the unhurried “Star” has a genial vibe enhanced by the sound of children’s voices. Stone offers cadences that move from a sing-song to martial beat in an affable manner as she declares her sense of self-worth. She never rushes the pace. She intones in different ways to let the song build in complexity. Think of it as the aural equivalent of a Lego set. One can use the simple bricks in different styles and colors to make something that stands out as special. Stone employs this trick on a number of fine songs, including the la la boom boom boom of “Molly Town”, the poppy “Love Me”, and the sultry “Stuck on You”. Stone lets the songs gather steam on their own power. The mellowest track, “Sensimilla", takes on the topic of ganja. Stone doesn’t have much to say on the subject other than it sure feels good to partake of (“Sensimilla / sending me love”). Hey, this is reggae, what would one expect? Stone’s easy going sound here never gets loud enough to bum one out. However, that’s not true of all the material. “Harry’s Symphony” offers glimpses of violence and bad boys enough to disturb. “Cut the Line” describes what it means to be shut out against one’s will. The clarion hip-hop inflected “Wake Up” alerts one to the dangers of modern day life. Songs like this prevent the album from being too serene, but they do seem tangential to the main vibe. Stone made her reputation as a rhythm and blues singer, and while R&B and reggae share the same radical roots, the two are quite different. Reggae allows Stone to get into a groove. When she goes with the flow, Stone offers smooth and rich vocals that suggest the promise of just chillin’ for its own sake. The problems of “Clean Water”, for example, imply that the answer is in our hands and it is beautiful. But when she prophesizes, as on “Way Oh”, the stronger beats weigh her down. Instead of being more soulful, she just sounds sore. Of course the world is full of problems, but she’s singing about “the beauty of love” here and Stone comes off as merely petulant. Water for Your Soul is Stone’s seventh album and reveals her willingness to experiment and try new things. She may not be always successful, but risking failure allows her to grow. And Stone’s voice, always her greatest asset, is in fine form here. She never sounds like she has to reach for a note, which can be deceptive. Just try singing along and one will see how big a range she has. The new record will please longtime fans and reggae aficionados, but probably not win new admirers.